The Law Offices of Stephen M. Fuerch is a personal injury and civil litigation law firm serving residents of Northern California. Founded by Oakland personal injury lawyer Stephen M. Fuerch, our firm helps clients throughout the East Bay solve their legal problems. With over 35 years of experience, Mr. Fuerch can effectively litigate your personal injury case, advise your business on legal matters, or help you protect your employment rights. At the Law Offices of Stephen M. Fuerch, we have an extensive personal injury practice. Practicing for more than three decades, attorney Stephen M. Fuerch has helped countless personal injury victims assert their rights and fight for the compensation to which they are entitled. Whether your injury case involves a car accident, truck accident, motorcycle accident, medical malpractice, construction accident, slip and fall, products liability, or wrongful death, our firm has the experience you need on your side. Under the legal principles of negligence, all people have a duty to act reasonably under the given circumstances, and when people breach that duty, they may be liable for the injuries their actions cause. Therefore, if you have been injured by the negligence of another, you may be entitled to compensation for your injuries and reimbursement for hospital bills and lost wages. At our firm, we understand California personal injury law, and we have the experience to gather the evidence you need to prove a variety of claims. Stephen M. Fuerch has litigated numerous auto accident cases on behalf of East Bay residents. He knows how to investigate the cause of the accident, deal with insurers, and negotiate effectively on your behalf. He will fight hard to protect your rights, and help you seek the compensation to which you are entitled. In the related realm of products liability law, designers and manufacturers have a legal responsibility to ensure that the products they sell to consumers are safe and effective. If a product unnecessarily puts consumers at risk, the manufacturer or others may be held liable for injuries caused by the product. At the Law Offices of Stephen M. Fuerch, we can help you recover money for injuries inflicted by a defective product and ensure that other consumers do not needlessly suffer. Finally, property owners, especially those with businesses that are open to the public, have a duty to keep their premises safe and warn visitors of any hidden dangers. If you have been injured on the property of another person or business due to a failure to repair or warn of such a danger, the Law Offices of Stephen M. Fuerch can help you work toward holding negligent landowners accountable. At the Law Offices of Stephen M. Fuerch, we take pride in protecting the legal rights of Californians. For many business owners, their business is their livelihood, and legal troubles that threaten their business can have damaging personal consequences. Whether your business is involved in a multi-million dollar deal or a contract dispute over a few thousand dollars, Stephen M. Fuerch has the experience to assess the situation and recommend the best solution. Our firm offers a full range of legal services for business, including those related to contract disputes, business formation, real estate disputes, mediation representation, labor disputes, and litigation. 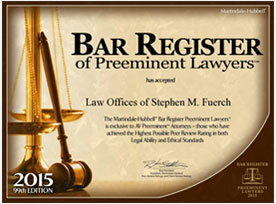 No matter your business’ legal needs, the Law Offices of Stephen M. Fuerch can provide guidance. California law offers some of the greatest protections in the country to employees. With more 35 years of experience, the Law Offices of Stephen M. Fuerch has helped numerous employees hold their employers responsible for illegal discrimination, harassment, and wrongful termination. If your employer has broken the law, you do not have to tolerate it. Contact our office to protect your rights. Located in Pleasanton, the Law Offices of Stephen M. Fuerch is perfectly situated to represent clients from all parts of the East Bay, including Oakland, Dublin, Fremont, Hayward, San Ramon, Walnut Creek, and throughout Alameda and Contra Costa Counties. Whether you have been involved in an injury accident, have questions about your business, or have been wrongfully terminated from your job, Oakland personal injury attorney Stephen M. Fuerch has the experience to help. Contact us by phone at (925) 463-1073 or through our contact page to schedule your free consultation today.